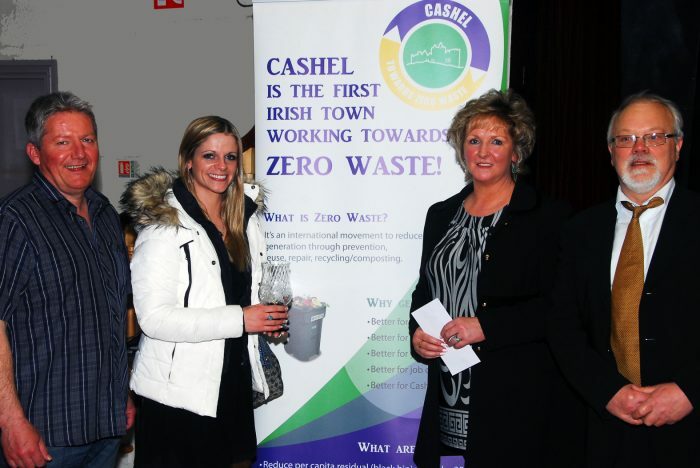 In keeping with the ‘Keep it Green’ theme of this years Cashel St. Patrick’s Day Parade a new category was introduced and sponsored by Zero Waste Cashel. The new category ‘Best Use of Recycled Materials’ was won by the Lawrence Academy Dance Company (LADC) who received a trophy and €100. In the true spirit of zero waste the parade organisers sourced the trophy from a recycling shop. This year LADC performed a new piece choreographed for this years theme Keep it Green’. The routine featured dancers from age 8 to 22 and was based on Reducing, Reusing and Recycling. It included a special feature of one of the LADCs students Emily from Tipperary Town who handmade a dress from all recycled products, it is made from mint sweets, plastic bags and break fluid piping. The Dress is a chandelier called Eclipse and was created for the Bank of Ireland Junk Couture Fashion Competition. The dress represents how beauty is created by recycling and how if we teach our children to look after our World, it will be a better place. Knockavilla N.S. the overall parade winners, also used recycled materials in their entry. The Children of Scoil Mhuire National School are very conscious of the ecosystem and the environment . Their theme “Don’t BEE Mean BEE Green” was inspired by a visit from their Local Bee Keeper. The children were made aware of the importance of Bee’s in our ecosystem and through pollination are responsible for a third of everything we eat and play a vital role in sustaining the planet’s ecosystem. A strong culture of recycling is encouraged at home and in the school. The children saved all recyclables’ over previous weeks. The Beehives were made from old newspapers, the Flying Bees were from decorated plastic bottles. The surrounding Multicoloured Flowers were made from plastic bottles, cut and painted by the children. The BEE Wings the children wore were made from old wire clothes hangers and used tights. “Towards Zero Waste Cashel” is an 18-month pilot initiative which promotes reducing waste and repairing and repurposing items. Led by environmental charity VOICE, funded by the Environmental Protection Agency (EPA) and supported by the Southern Region Waste Management Office and Tipperary County Council, this pioneering new project aims to take a typical Irish town on a journey of change.